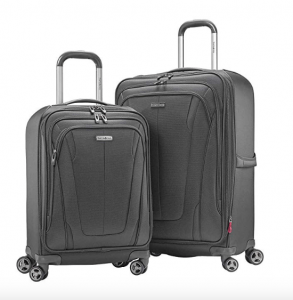 Samsonite GT Dual is a hot new release soft-shell luggage set of two pieces with a modern design. It is offered in black or purple colors and by choosing the purple you’ll be able to separate your luggage from the others on the airport carousels when you get off the plane. These bags have the 360-degree dual spinner wheels that rotate in different directions. They also have the three stage telescoping handles that lock at three points when you need to push them before you or pull them behind you when you’re trying to get to the plane via check-in desk and security control. The pull handles have an ergonomic design that gives you a comfy hold. The large Samsonite GT Suitcase has the measurements of 30 x 19 x 11.75 inches (27H x 18.5W x 9.25D inches of interior dimensions) and you need to leave it at the check-in desk before your flight. And with a spacious interior, it lets you pack in quite a bit of your clothes, shoes and other stuff. 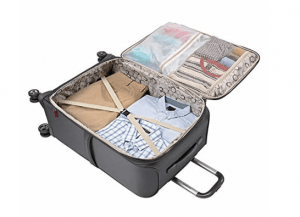 The small carry-on bag measures 23.75H x 16W x 10D inches (and 20.5H x 15W x 7.5D inches of packing space) and can be used as a cabin bag on most domestic and global flights. Please check the restrictions with the airline you will be flying with. Apart from the sturdy metal handle these bags include the comfortable grip fabric handles on the side and the top. The hundred percent nylon covered exterior is water resistant and sturdy and durable over several years of use and bad treatment by the terminal staff. There are multiple pockets on the outside and they will let you better organize your belongings, and this may be where you also put the things you want to have easy access to. You have the compression straps on the right-hand side so that your clothes stay put in place and secure. And the large mesh zip pocket on the other side, an organizational panel with shoe pockets and another pocket for your wet items. This is good when you had a swim in the hotel pool before your check out and you do not want to mix it with your other clothing. These bags are great for a better organization before your journey. And they are expandable through the middle zippers to give you more space you may need. The GT Dual is promoted as the collection that adds a modern touch to the historical heritage of the Samsonite brand. Please note that these bags are 100% nylon and not 1200D or 600D polyester. To sum up, they offer very decent value for the dollar.